Our Closet Essentials Sale is HERE and for a limited time you can save 15% on over 750 closet essentials products that transform and complete the organization of any closet! And to kick off this sale of transformation, we're bringing you a new social series called #turnyourclosetaround that follows several creative social media bloggers as they rehaul their closets with our products! We'll have several bloggers featured throughout the sale, each using a 360 camera to make every angle of their closet visible to you during the transformation. 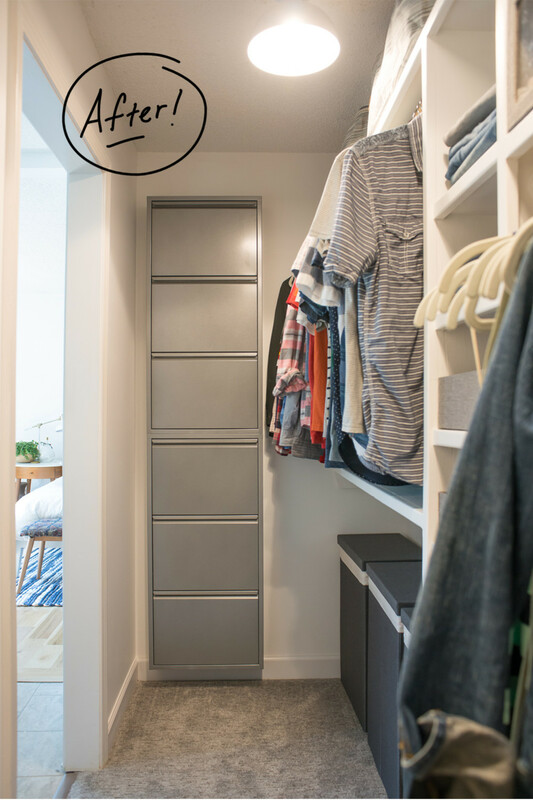 First up is home improvement blogger, Ashley Mayes of @biggerthanthethreeofus, who reworked her master closet to make the most of the slightly narrow space. Check out the before and after videos below and shop a few of the essentials she used to make her closet perfect. 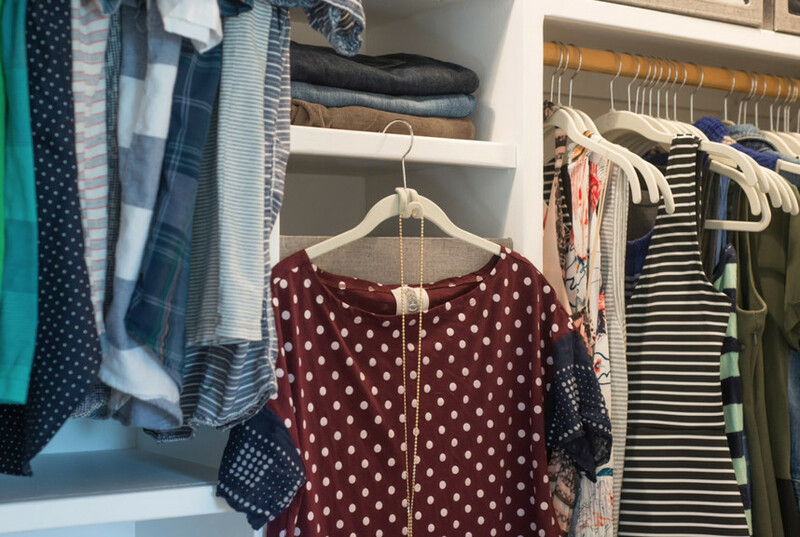 Before, Ashley's master closet had no system of order. Belts were crammed together in a corner, shirts were piled on top of one another with no way to sort and bulky hangers were taking up too much real estate. 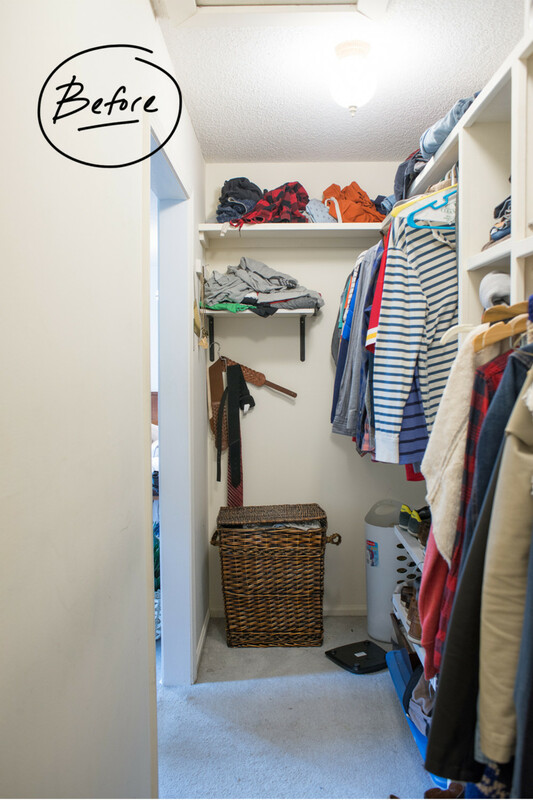 Now, this master closet has a place for everything and everything in its place. Our Three Drawer Shoe Cabinet is front and center in the space. It stores and organizes all of Ashley and her husband's shoes out of sight and out of mind. Plus, its narrow frame and footprint takes up virtually no space in her closet. Poppin Hampers are a true standout on laundry day, and the size is perfect to be stored directly under Ashley's shelves. Each features a sturdy but soft exterior with integrated handles and a fitted lid. Inside, the canvas liner doubles as a laundry bag that travels easily from hamper to washer. Best of all, the exterior collapses flat for convenient storage when Ashley only needs one. Ashley stored her and her husband's rarely used clothing in our Umbra Artisan Storage Bags. The material is loom woven with one continuous natural thread which creates an ever-changing organic look and feel that integrates seamlessly into the aesthetic of her closet. Label holders on both sides make them a breeze to identify contents without Ashley having to unzip or pull off of a shelf to see. Our 4-Pair Boot Racks gave Ashley all the storage she needed to organize her boots without folding them over each other. They're designed to easily hold up to four pairs of boots upright, preserving their shape and helping them dry out after a walk in the rain or snow. And, the compact design doesn't take up a lot of floor space so Ashley can build her growing boot collection with ease. Ashley's favorite addition to the space had to be our Huggable Hangers. Their non-slip velvety finish prevents clothing from slipping off the hanger while still protecting delicate garments. And, the slim, compact profile of each hanger helped conserve all of Ashley's precious hanging space! Ashley filled in the vertical gaps between shelves with a stylish touch from our Linen Drop Front Sweater Box collection. They protect against dust while keeping everything inside easy to access even when stacked. This is also a great solution for storing Ashley's clutches and handbags when she doesn't have the shelf space! Our Purse Storage Bins utilized all of Ashley's remaining space on her top shelves. They're perfect to store her larger bags, backpacks and totes, and their open design makes them easy to organize everything inside. 3-Section Drawer Organizers finished off the open cubby space inside the closet. They come in four sizes that work just as well within a drawer as they would on top of one. They're perfect to help maximize the space of oddly shaped corners, shelves and more. Watch Ashley's video of her complete closet reveal and all of her favorite products within it, below. Let us know which products you love most by commenting, and don't forget to shop our Closet Essentials Sale going on now! Stay tuned to the blog and our social channels to see which blogger we have turning their closet around next!